Global Food Pathogen Testing Market size was worth over USD 3 billion in 2016 and will surpass 850 Million tests by 2024. 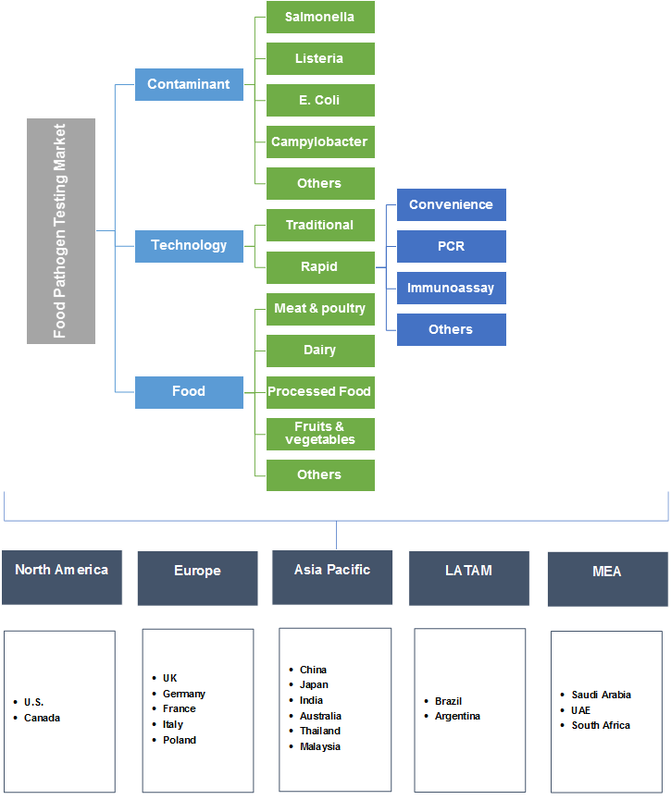 Consistent development in global food & beverage industry in terms of quality to meet customer expectations will drive food pathogen testing market. As per analysis, the food industry is projected to surpass USD 3.03 trillion by 2020, growing at a rate of 4.5%. Dairy industry expansion is directly proportionate food pathogen testing demand. Improvement in milk processing technologies and farmer's training and strict safety norms by the government are likely to propel industry growth. According to FAO, Asia Pacific dairy industry expenditure was around USD 100 billion in 2016 and it is projected that milk production will surpass 120 million tons in coming years. Increasing safety regulations owing to number of cases regarding food poisoning has positively influenced demand. Statistics suggests that around 1 in every 10 persons fall ill every year due to contaminated food consumption. Shifting trends towards globalization in food supply chain management owing to flexible trade policies promoting import and export will further support industry growth. Advancement in contaminant detection methods including polymerase chain reaction and immunomagnetic separation for reducing detection time and sensitivity will provide lucrative opportunities for industry growth. However, lack of awareness and knowledge about the food safety regulations among manufacturers may hamper industry growth. Salmonella was valued at over USD 1.2 billion in 2016, rise in substantial number of food borne disease owing to presence of salmonella in fruits & vegetables, processed food, dairy, and meat will drive demand. Listeria will witness gains at over 7% up to 2024. Increasing disease outbreak because of listeria contamination will support this segment’s growth. Serious complications cause including, miscarriage in pregnant women, pre-mature delivery, still birth and infection in new born has increased market penetration. Centre for Disease Control and Prevention (CDC) has estimated that in the U.S., listeria is the third leading cause of death of over 260 people every year. More than 1,600 people get sick from listeria every year in the U.S.
E. coli will be worth over USD 1.1 billion by 2024. Increasing incidences of various diseases including, diarrhea, urinary tract infection, respiratory illness and pneumonia will drive this segment’s growth. Traditional technology segment will grow at over 6.5% up to 2024. Low initial cost and simple steps associated with the test will support this segment’s growth during forecast period. PCR technology holds 14% of the overall industry share. Increased accuracy, reduced cost and rapid test results is likely to drive this segment growth. Rapid technology method will be worth over USD 3.5 billion by 2024. Low processing cost, less time & labour requirement and high-test speed are the factors propelling this segment growth. However, high initial cost may retrain the rapid technology industry growth. Meat & poultry will grow at over 7% up to 2024. campylobacter E. coli and salmonella are the key contaminants found in these products. Poor hygienic conditions and improper handling during skinning & befeathering results in contamination which is expected to support this segment growth. FSIS have established new rules for preventing meat & poultry products contamination in processing & slaughter plants based on Hazard Analysis Critical Control Point (HACCP) system. Dairy segment was valued at over USD 600 million in 2016. Increased diseases in animals owing to direct contact of milk with infected animals has resulted in product demand in this segment. High survival rate of some microbes including, listeria post pasteurisation technique is encouraging the industry growth. North America market will be worth over USD 2 billion by 2024. Increasing awareness among consumers towards fodder safety, recent disease outbreaks and rising usage of preservatives are the key factors supporting the industry growth in this region. High medical expenses and increased use of genetically modified organisms in food & beverages industry will fuel regional industry growth. Stringent government regulations regarding product safety has further up surge the industry growth. For instance, CFIA lays down safety standards for taking corrective actions including, issuing public notices, sampling and recalling of products posing health risks. Asia Pacific will witness gains at over 8% up to 2024. Stringent government norms coupled with increasing number of manufacturing firms will drive regional industry growth. Japan has been on the forefront for registering patents to develop technologies used for detecting contaminants. Europe market will be worth over USD 1.7 billion by 2024, rise in meal contaminant illness. Increasing government efforts for curbing pathogens related epidemics will support industry growth in the region. Global industry share is moderately consolidated with top three players holding nearly 45% of the global industry demand. SGS, Det Norske Veritas, Intertek and Bureau Veritas are the key industry participants. Other prominent players are Micro Bac Laboratories, Eurofins Scientific, Genon Laboratories, Lloyd’s Register Quality Assurance and Rapid Bio Systems. Maintaining optimum quality for protecting brand equity is the key strategy adopted by nutritional products manufacturers. This will provide lucrative opportunity for the industry growth. Stringent safety regulations by the government for forage processing to reduce contamination will propel the industry growth. The pathogen testing is used to test contamination level in processed, canned and frozen products. It is also used for farm-fresh products to ensure that these products do not have any type of contamination. Chemicals and contaminants can make entry at any stage of value chain, starting from farm to manufacturing, till it reaches to the consumers. Hence, its testing becomes important at every stage.